Leadbetterella byssophila Weon et al. 2005 is the type species of the genus Leadbetterella of the family Cytophagaceae in the phylum Bacteroidetes. Members of the phylum Bacteroidetes are widely distributed in nature, especially in aquatic environments. They are of special interest for their ability to degrade complex biopolymers. L. byssophila occupies a rather isolated position in the tree of life and is characterized by its ability to hydrolyze starch and gelatine, but not agar, cellulose or chitin. Here we describe the features of this organism, together with the complete genome sequence, and annotation. L. byssophila is already the 16th member of the family Cytophagaceae whose genome has been sequenced. The 4,059,653 bp long single replicon genome with its 3,613 protein-coding and 53 RNA genes is part of the Genomic Encyclopedia of Bacteria and Archaea project. Strain 4M15T (= DSM 17132 = JCM 16389 = KACC 11308) is the type strain of the species Leadbetterella byssophila, which is the type species of the genus Leadbetterella. Currently L. byssophila is the only validly named species in this genus. The type strain was isolated by Weon et al. from cotton-waste compost soil used as mushroom cultivation in Suwon, South Korea. L. byssophila is described as aerobic, rod shaped and non-motile. The species belongs to the Cytophaga-Flavobacterium-Bacteroides (CFB) group, also known as the phylum Bacteroidetes , which comprises organisms associated with the degradation of complex polysaccharides. The CFB group consists of many bacterial strains isolated from marine environments and hypersaline lakes; but only a few were isolated from other habitats such as soil. Various taxonomic treatments have placed L. byssophila either in the family ‘Flexibacteraceae’ or the family Cytophagaceae. This is most probably due to a number of nomenclatural problems. The family ‘Flexibacteraceae’ as outlined in TOBA7.7  would include Cytophaga hutchinsonii, which is the type species of the genus Cytophaga, which in turn is the type of the family Cytophagaceae, a name that may not be replaced by the family name ‘Flexibacteraceae’ as long as Cytophaga hutchinsonii is one of the included species. A similar problem arises with the placement of Spirosoma linguale in the higher taxonomic ranks and has been discussed previously . Here we present a summary classification and a set of features for L. byssophila 4M15T, together with the description of the complete genomic sequencing and annotation. L. byssophila 4M15T is very isolated in the tree of life, with no other species allocated to the same genus and with the type strains of the members of the genus Emticicia [5–6] sharing the highest degree of 16S rRNA sequence identity (88.3-88.9%) , followed by Sporocytophaga myxococcoides (85.2%)  and Siphonobacter aquaeclarae (85.0%) . No other cultured strain belonging to the species or genus has been described. 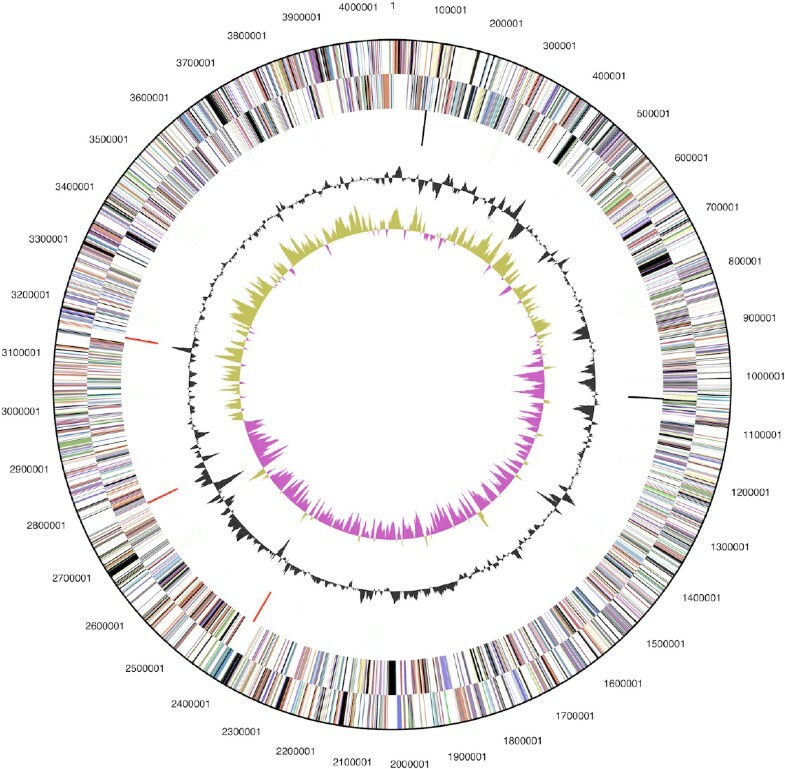 Only one 16S rRNA sequence from a moderately related (95% sequence identity) uncultivated clone, W4S69 (GU560170), identified by Xu and colleagues in pharmaceutical wastewater biofilms, was reported in GenBank. Neither environmental screenings nor genomic surveys produced any sequence that could be linked to the species L. byssophila or the genus Leadbetterella, indicating that members of the species are not heavily represented in the so far screened habitats (status November 2010). A representative genomic 16S rRNA sequence of L. byssophila 4M15T was compared using NCBI BLAST under default settings (e.g., considering only the high-scoring segment pairs (HSPs) from the best 250 hits) with the most recent release of the Greengenes database  and the relative frequencies, weighted by BLAST scores, of taxa and keywords (reduced to their stem ) were determined. The five most frequent genera were Pedobacter (35.1%), Flectobacillus (11.4%), Leadbetterella (9.4%), Algoriphagus (8.6%) and Arcicella (6.8%) (80 hits in total). Regarding the single hit to sequences from members of the species, the average identity within HSPs was 100.0%, whereas the average coverage by HSPs was 97.9%. Among all other species, the one yielding the highest score was ‘Kaistomonas ginsengisoli’, which corresponded to an identity of 92.2% and a HSP coverage of 49.8%. The name ‘Kaistomonas ginsengisoli’ (strain Gsoil 085, AB245370) is also to be found in a number of publications [12–14], but that has since become the type strain of Emticicia ginsengisoli . The highest-scoring environmental sequence was HM238135 (‘structure full-scale air pig facility biofilter treating waste gas clone FF 92’), which showed an identity of 93.1% and a HSP coverage of 96.0%. The five most frequent keywords within the labels of environmental samples which yielded hits were ‘lake’ (4.8%), ‘litholog/stream’ (4.5%), ‘biofilm’ (3.3%), ‘microbi’ (2.9%) and ‘site’ (2.5%) (170 hits in total). The five most frequent keywords within the labels of environmental samples which yielded hits of a higher score than the highest scoring species were ‘soil’ (5.1%), ‘biofilm/oxid’ (5.1%), ‘air, biofilt, facil, full-scal, pig, structur, treat, wast’ (2.7%), ‘forest, ghat, ground, india, mangrov, nich, prokaryt, select, studi, swab, western’ (2.7%) and ‘cold, spring’ (2.6%) (5 hits in total). Figure 1 shows the phylogenetic neighborhood of L. byssophila 4M15T in a 16S rRNA based tree. The sequences of the three 16S rRNA gene copies in the genome do not differ from each other, and do not differ from the previously published 16S rRNA sequence (AY854022). Phylogenetic tree highlighting the position of L. byssophila relative to the type strains of the other genera within the family Cytophagaceae. The tree was inferred from 1,340 aligned characters [15–16] of the 16S rRNA gene sequence under the maximum likelihood criterion  and rooted with the type strain of the closely related family Sphingobacteriaceae. The branches are scaled in terms of the expected number of substitutions per site. Numbers above branches are support values from 900 bootstrap replicates  if larger than 60%. Lineages with type strain genome sequencing projects registered in GOLD  are shown in blue, published genomes in bold [4,20,21]. Cells of L. byssophila stain Gram-negative and are non-motile, rod shaped with a width of 0.6–0.9 µm and a length of 2–7 µm (Figure 2 and Table 1). Colonies are circular, 1–2 mm in diameter, smooth, light orange, shiny and convex with entire margin when grown on trypticase soy agar. After prolonged incubation colonies become dark orange. Strain 4M15T grows under aerobic conditions at temperatures of 15–45°C and at a pH range of 6.0–8.0. The strain grows in the presence of 1% (w/v) NaCl, but not at 3% NaCl . Growth on carbohydrates (API 20NE) was observed for glucose, arabinose, mannose, N-acetylglucosamine and maltose but not for mannitol. Strain 4M15T was positive for indole production and β-galactosidase, and negative for nitrate reduction and arginine dihydrolase (API 20NE). Enzymatic activity was detected for alkaline phosphatase, leucine arylamidase, valine arylamidase, trypsin, acid phosphatase, naphthol-AS-BI-phosphohydrolase, α-glucosidase, β-glucosidase, N-acetyl-β-glucosaminidase and α-fucosidase; weak enzymatic activity was observed for α-galactosidase and β-galactosidase (API ZYM). L. byssophila produces catalase and urease . Whereas starch, gelatin, aesculin and tyrosine are hydrolyzed; agar, casein, cellulose and chitin are not. Strain 4M15T is sensitive to ampicillin, carbencillin, lincomycin, streptomycin and tetracycline and shows resistance to benzylpenicillin, gentamicin, neomycin, oleandomycin and polymyxin B. Classification and general features of L. byssophila according to the MIGS recommendations . The fatty acids of strain 4M15T comprise a complex mixture of straight chain saturated and unsaturated acids, together with iso-branched, anteiso-branched and hydroxylated acids. The fatty acids comprise iso-C15:0 (24.2%), C16:1ω5c (2.8%), C16:0 (5.6%), iso-C15:0 3-OH (2.8%), iso-C17:1ω9c (1.4%), C16:0 3-OH (2.5%), iso-C17:0 3-OH (10.5%) and the summed feature listed in the MIDI Sherlock system as C16:1 ω7c and/or iso-C15:0 2-OH (30.5%) and iso-C15:0 2-OH and/or C16:1 ω7c (15.9%). These two peaks probably represent C16:1 ω7c (30.5%) and iso-C15:0 2-OH (15.9%) of the fatty acids. The presence of saturated, unsaturated straight chain fatty acids, together with branched chain (largely iso-) normal and 2-OH and 3-OH derivatives is fairly typical of the aerobic members of the Bacteroidetes. The major isoprenoid quinone is menaquinone MK-7, a trace amount of menaquinone MK-8 was detected . The polar lipids of L. byssophila have not been determined, but for a number of other taxa, including Rudanella lutea 5715S-11T, S. linguale DSM 74T, Larkinella insperata LMG 22510T and some members of the genus Sphingobacterium and Parapedobacter [29–30] the presence of phosphatidylethanolamine as the major (diglyceride based) phospholipid and a number of not further characterized lipids and amino lipids provide useful taxonomic and evolutionary markers . L. byssophila 4M15T, DSM 17132, was grown in DSMZ medium 545 (Tryptone soya broth, TSB)  at 30°C. DNA was isolated from 0.5–1 g of cell paste using Qiagen Genomic 500 DNA Kit (Qiagen, Hilden, Germany) following the standard protocol as recommended by the manufacturer with modification st/L for cell lysis as described in Wu et al. . DNA is available through the DNA bank Network [35–36]. The genome was sequenced using a combination of Illumina and 454 sequencing platforms. All general aspects of library construction and sequencing can be found at the JGI website . Pyrosequencing reads were assembled using the Newbler assembler version 2.3-PreRelease-10-21-2009-gcc-4.1.2-threads (Roche). The initial Newbler assembly consisting of 73 contigs in one scaffold was converted into a phrap assembly by making fake reads from the consensus, collecting the read pairs in the 454 paired end library. Illumina GAii sequencing data (420.0 Mb) was assembled with Velvet  and the consensus sequences were shredded into 1.5 kb overlapped fake reads and assembled together with the 454 data. The 454 draft assembly was based on 237.2 MB 454 draft data and all of the 454 paired end data. Newbler parameters are -consed -a 50 -l 350 -g -m -ml 20. The Phred/Phrap/Consed software package  was used for sequence assembly and quality assessment in the following finishing process. After the shotgun stage, reads were assembled with parallel phrap (High Performance Software, LLC). Possible mis-assemblies were corrected with gapResolution , Dupfinisher, or sequencing cloned bridging PCR fragments with subcloning or transposon bombing (Epicentre Biotechnologies, Madison, WI) . Gaps between contigs were closed by editing in Consed, by PCR and by Bubble PCR primer walks (J.-F.Chang, unpublished). A total of 195 additional reactions were necessary to close gaps and to raise the quality of the finished sequence. Illumina reads were also used to correct potential base errors and increase consensus quality using a software Polisher developed at JGI . The error rate of the completed genome sequence is less than 1 in 100,000. Together, the combination of the Illumina and 454 sequencing platforms provided 176.4 × coverage of the genome. Final assembly contains 1,209,137 pyrosequence and 14,794,926 Illumina reads. The genome is 4,059,653 bp long and comprises one circular chromosome with a 40.4% G+C content (Table 3 and Figure 3). Of the 3,666 genes predicted, 3,613 were protein-coding genes, and 53 RNAs; 148 pseudogenes were also identified. The majority of the protein-coding genes (64.8%) were assigned with a putative function while the remaining ones were annotated as hypothetical proteins. The distribution of genes into COGs functional categories is presented in Table 4. The orange color of L. byssophila is due to the presence of flexirubin, a pigment consisting of an ω-phenyloctaenic acid chromophore esterified with resorcinol carrying two hydrocarbon chains. Flexirubins are yellow under neutral pH conditions and become red under alkaline conditions. 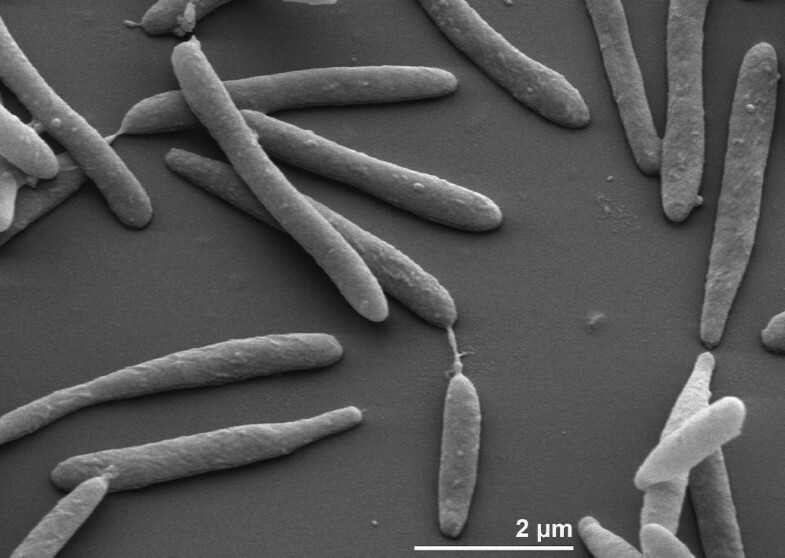 In Flavobacterium johnsoniae a cluster of genes involved in flexirubin synthesis was identified , with Fjoh_1102 and Fjoh_1103 having likely roles in the synthesis. Homologs of these genes were also identified in the flexirubin-producing Bacteroidetes Flavobacterium psychrophilum and C. hutchinsonii, Fjoh_1102 and Fjoh_1103 are similar to Pseudomonas aurantiaca darA and darB which are involved in biosynthesis of the antifungal compound 2-hexyl-5-propyl-alkylresorcinol. In 2009 McBride and colleagues demonstrated the important role of Fjoh_1102 and Fjoh_1103 in flexirubin synthesis by constructing an insertion mutant which was cream colored because of the missing flexirubin . Homologs of Fjoh_1102 and Fjoh_1103 were identified in the genome of L. byssophila (Lbys_1508 and Lbys_1509), therefore an important function of these genes in the flexirubin synthesis can be inferred. Although L. byssophila was isolated from cotton waste, which is mainly composed of cellulose, lignin and hemicellulose, the ability to degrade carboxymethylcellulose and filter paper could not be detected; solely D-cellobiose was assimilated . A closer look into the genome sequence of L. byssophila revealed the presence of three genes coding cellobiose or cellulose hydrolyzing enzymes: two β-glucosidases belonging to glycoside hydrolase family 3 (Lbys_0274, Lbys_1260) and one endoglucanase belonging to glycoside hydrolase family 5 (Lbys_2254). In order to test whether these endoglucanases actively hydrolyze cellulose we carried out a relatively sensitive assay, using hydroxyethylcellulose with a crosslinked azurin as substrate (AZCL-HEC, Megazyme, Ireland). In this test L. byssophila was not able to hydrolyze hydroxyethylcellulose (own unpublished data).This observation conforms with the studies done by Weon and colleagues . The finding of three genes probably coding for α-amylases (Lbys_0590, Lbys_2307, Lbys_2308) is consistent with the observed starch degrading ability of L. byssophila . A closer look into the genome sequence revealed four xylan degrading enzymes, three endo-1,4-β-xylanases belonging to glycoside hydrolase family 10 (Lbys_1832, Lbys_2128, Lbys_2331) and one xylan-1,4-β-xylosidase belonging glycoside hydrolase family 43 (Lbys_2333). To date the degradation of xylan by L. byssophila was not described, but we could demonstrate the hydrolysis of xylan in a plate assay using xylan with a covalently bound dye as a substrate (remazol brilliant blue-D-xylan, Slovak Academy of Science) (own unpublished data). L. byssophila tested positive for catalase and oxidase  The respective genes were identified in the genome sequence. Lbys_1881 encodes a catalase and the genes coding cytochrome C oxidase are localized in the region between Lbys_2190 and Lbys_2195. We would like to gratefully acknowledge the help of Helga Pomrenke for growing L. byssophila cultures, Susanne Schneider for DNA extraction and quality analysis and Jennifer Gregor for substrate assays (all at DSMZ). This work was performed under the auspices of the US Department of Energy Office of Science, Biological and Environmental Research Program, and by the University of California, Lawrence Berkeley National Laboratory under contract No. DE-AC02-05CH11231, Lawrence Livermore National Laboratory under Contract No. DE-AC52-07NA27344, and Los Alamos National Laboratory under contract No. DE-AC02-06NA25396, UT-Battelle and Oak Ridge National Laboratory under contract DE-AC05-00OR22725, as well as German Research Foundation (DFG) INST 599/1-2. Garrity GM, Lilburn TG, Cole JR, Harrison SH, Euzéby J, Tindall BJ. Taxonomic outline of the Bacteria and Archaea, Release 7.7 March 6, 2007. Part 11 — The Bacteria: Phyla ‘Planctomycetes’, ‘Chlamydiae’, ‘Spirochaetes’, ‘Fibrobacteres’, ‘Acidobacteria’, ‘Bacteroidetes’, ‘Fusobacteria’, ‘Verrucomicrobia’, ‘Dictyoglomi’, ‘Gemmatimonadetes’, and ‘Lentisphaerae’. http://www.taxonomicoutline.org/index.php/toba/article/viewFile/188/220202007.